Abu Rawash, A pyramid that was “lost” - and has now been found! A pyramid that was “lost” - and has now been found! In the steamy heat of June the press was once more buzzing with stunning official news announced by the Supreme Council of Egyptian Antiquities: Egypt has found the mysterious traces of the 4th lost pyramid! This provocative announcement stirred up a gale of protest among many Egyptologists, and you are about to find out exactly why. I just had to get some firsthand information and find out the truth of the matter as quickly as I could. During the 20 years I’ve spent toing and froing around sites all over the country my intuition in matters of archaeological discoveries has been finely honed. I had a hunch that behind this controversial news lay some intriguing facts. So I made my way to the site without delay. 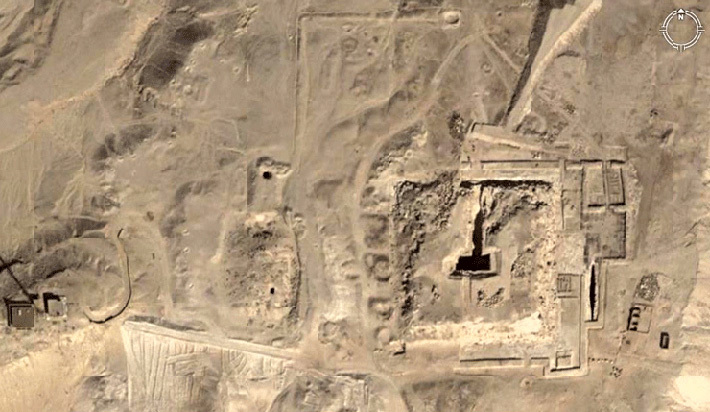 View from space of Abu Rawash site you can see the open air entrance of the pyramid. But this time I could clearly see on the right the profile of the plateau, now cleaned up, as we went round the last bend and started up a rising slope. Soon we were at the top and the jeep stopped. As I got out I could feel a welcome hilltop breeze that cooled us off a little in spite of the 40 degree heat. The magnificent view took my breath away. Just opposite on the far side of the valley I could see the pyramids of Kephren, its big sister Cheops and Mykerinos. Right away I noticed something interesting: maybe where I was standing was a continuation of the Giza plateau in spite of the break of the valley. Maybe the plateau did not start where the better known pyramids are, as is generally supposed? In any case I was at the northernmost point of what Egyptologists call ‘the Memphis complex’. I could see too that I was on a strategic high point with views in all four directions. In the distance in front of me were the three famous pyramids, with the valley between curving around to my left, and on the right was the delta, extending as far as the Mediterranean. No wonder that Napoleon set up camp with his troops on the heights of Abu Rawash! 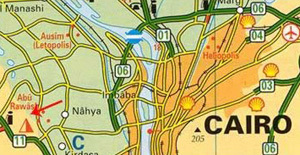 From this spot he could keep an eye on everything, including the roads into Cairo. Behind me was the so-called fourth pyramid, the real name of which is ‘the firmament of Redjedef’, a building attributed to the Pharaoh Redjedef (usually called Djedefre in English), son of Cheops, third pharaoh of the Fourth Dynasty. My first thought in response to the press announcement was, why call this pyramid the fourth? Fourth in relation to what? I suppose it referred to the three Giza pyramids, but it could have nothing to do with their official dating. Since Mykerinos was the nephew of Djedefre, his pyramid, which came after that of his uncle, ought to be labelled the fourth. And in fact the site of the Djedefre pyramid on its headland makes it the most northerly of the whole plateau, so it would have made more sense to call it the first! My second thought was about the reaction from the Egyptologists. The official communiqué definitely referred to the pyramid as ‘vanished’, or even ‘lost’ in other news reports. But this pyramid has always been known! Vyse and Perring discovered the site in 1830. We have the drawings done by Lepsius in 1842 and 1843. The great Flinders Petrie did some exploratory surveys in 1880 and 1882, and Emile Chassinat, director of the IFAO (French Institute of Oriental Archaeology) in Cairo, carried out excavations and exposed the east side of the pyramid in 1901 and 1902. After that Pierre Lacau, Pierre Montet, Charles Kuentz and a large team excavated the area in 1912 and 1913. 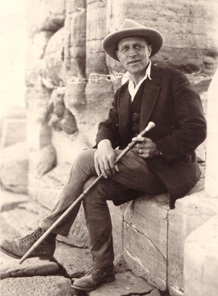 The remarkable French archaeologist Fernand Bisson de la Roque worked there from 1922 and his account of his excavations at Abu Rawash (written in French as Abou Roasch) is still a valuable source of information. In the 1960s new excavations were carried out by Maragioglio and Rinaldi. Then for the last 12 years a Franco-Swiss team with Michel Valloggia of Geneva University have been working there flat out with the help of Michel Baud from the Louvre and Yann Tristant, the IFAO prehistory specialist. So this pyramid is very far from being ‘lost’! On the contrary it has been studied in detail for many long years, far from the public eye. But we are getting used to the game of hide-and-seek with the misleading statements issued by the Directorate of Egyptian Antiquities. When I saw the site for myself I realised why it had been kept out of the limelight for all this time - it contains some fascinating and very unusual features! As I turned round I saw right away the east side of the pyramid, now only about 10 metres high but 122 metres long on each side. And this prompted my third query about the official announcement, which said that the pyramid of Djedefre was “higher by 7.62m than that of his father Cheops”. Now the Great Pyramid is 146m high, so the statement was obviously impossible. The actual size of the Djedefre pyramid with its slope of 64° was much closer to the size of the Mykerinos pyramid, the smallest of the three, being 68m high and 102m long. Doing a quick calculation with these figures, I estimated a height of 125m (not 153.62m), which is good enough. For its part the IFAO referred to an original height of only 67m and a length of 106m. So even among the experts there is no agreement! That didn’t really surprise me because nobody agrees either about how long Djedefre reigned; for only eight years according to the Turin list or else 23 years if one assumes that one year of a reign did not refer to a calendar year of 365 days but to a complicated reckoning of census dates carried out every two years. Now I was on the spot, I had the clear thought that if this pyramid had been so high it was because of the height of the headland it is built on. It was undoubtedly higher overall than that of Cheops opposite. 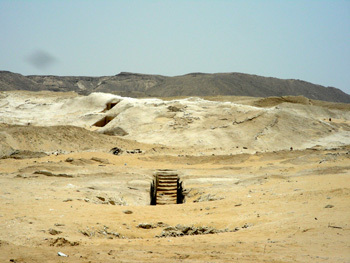 The Abu Rawash headland was perhaps 7m higher than the Giza plateau and is the highest point of this fabulous landscape. Ancient writers gave the Djedefre pyramid the name ‘hr’, ‘the highest pyramid/temple’ (see Grinsell pp.97-8 and Perring). Having walked along the east side, I am now in front of the passage way leading down to the heart of the pyramid. Gigal inside the descending passage. As I made my way towards the south face of the pyramid I noticed chunks of red granite scattered here and there on the ground. For a long time Egyptologists thought the pyramid had been left unfinished, an opinion that kept at a distance certain experts who wanted to make dramatic discoveries. What could be interesting about a pyramid that was now only 10m high? However in the light of recent work there is now a substantial consensus among Egyptologists that the pyramid was actually finished. Remains were found of a small ceremonial temple on one side, of the kind usually built only when a pyramid was completed. 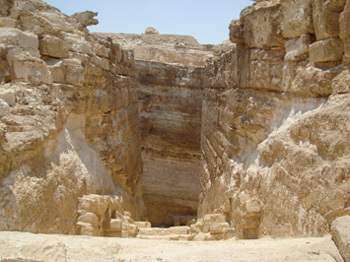 The fact is that the pyramid was literally pulled to pieces and dismantled, especially from the Greco-Roman period onwards, and for more than two thousand years it was used as a quarry, even though there is a real quarry at Gebel Madawara just 2km to the east that supplied limestone. At the end of the 19th century Flinders Petrie mentioned that he’d seen 300 camels a day laden with stones leaving the pyramid site! The perfectly squared blocks were probably used to rebuild some of the buildings in the valley and maybe even in the suburbs of Cairo. We know that some were used to build the nearby Coptic monastery of Deir Nayha, north of the Djedefre pyramid in the Wadi Qarun. Going a little further I noticed right away, in front of some recently restored structures that looked like storerooms, a trench carefully carved out of the rock in the shape of a boat. This boat pit was beautifully cut, deep and narrow, so it must have been just wide enough to hold the body of the boat. In the photos you can see how it is shaped. Knowing as I do from close up the dozens of boat pits on the Giza plateau, as well as the proto-dynastic boats buried behind the city of Abydos in the south of Egypt, I can assure you that this one is exceptionally fine. 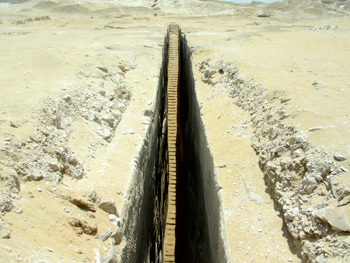 The lengthwise axis of the trench, 35m long, follows the curve of a boat very accurately. In it Emile Chassinat found fragments of about 120 red quartzite statues and three painted heads of the pharaoh (the heads are now in the Louvre and in the Cairo Museum). Chassinat also found on the east side of the pyramid the remains of a small brick-built temple, and in its courtyard fragments of a column inscribed with the pharaoh’s cartouche as well as some statues of him as a child that had been smashed to pieces. He deduced that these had all been destroyed deliberately in the past. 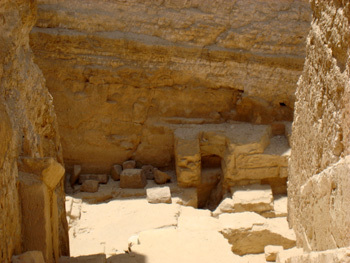 It is from these fragments that the pyramid has been attributed to Djedefre. I turned to look at the eastern façade and there the guide from the Inspectorate encouraged me to climb up the rows of stone blocks. A great surprise was in store! I knew that in the middle there was a deep passage now open to the sky, but to see the entrance way and follow its slope down into the heart of the pyramid as far as the so-called ‘king’s chamber’ was intensely moving. I was fascinated. Michel Valloggia told how he had had to get an 80-tonne crane to come to lift away the stones blocking the passage. The slope, 5m70 wide and 48m long, was steep and the stones slippery. As I went I noticed two things: some blocks of pale limestone, recognisable from their colour and quality as unmistakably from the Tura quarries east of Cairo, in a line along each side, and some traces within the descending passage itself of other small structures. The rectangular room it leads to is 21m long and 9m wide. I could see the sky through the vertical light shaft above, an impressive 20m from top to bottom, and remembered that the Swiss Professor Valloggia had sent to Geneva for a team of climbers to come and remove the loose blocks of stone that were in danger of falling on the very spot where I was standing … The most remarkable thing was the natural bedrock that made the core of the pyramid. 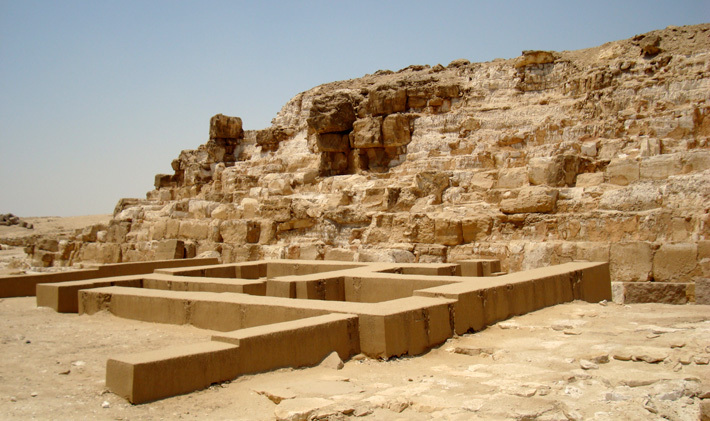 As in the pyramid of Senusret II and several others, the foundation blocks were bedded on a solid outcrop of natural rock, the rows of blocks being tilted slightly towards the centre. The bedrock core and the tilt of the stonework contributed greatly to the stability of the whole edifice. A number of Egyptologists think that originally this was an angled pyramid like that of Snefru with its double-angled slope, or like the stepped pyramid of Djoser at Saqqara. I noticed in the chamber several limestone facing blocks against the bottom of the walls as well as a small structure on the south side. I could also see on the north side a tunnel that robbers had cut long ago to get into the pyramid, and the beginning of a corridor underneath the sloping entrance passage. What struck me most was the way the rock had been cut through to such a depth. I wondered what the Professors Davidovits and Demortier would make of it (see L’Egypte issue no. 1, exclusive report). Their remarkable knowledge and innovative research might give us a decisive interpretation of the structure of the pyramid because the compacted material in some layers of rock could easily be seen. 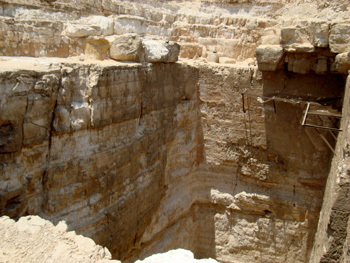 In fact there were several puzzles in the sedimentary formation of the Abu Rawash headland. There was much to be learned from the internal structure. I had a secret hope that the pioneers who had demonstrated that certain stones had been not carved but cast could exercise their talents in this amazing place. I hoped also that it would be opened to the public. When I asked the regional director about this he said, “In two years”. Finally I made my way slowly back up the sloping passageway, and once I got to the top I was helped to climb the 10m walls to admire the all round view, with Giza to the south. I must mention some incredible features of this pyramid. According to the experts its outer covering consisted of polished granite thinly coated with an alloy of gold, silver and copper. This was announced in the official leaflet about the TV documentary that is to be made. I can’t wait to find out more - if it was confirmed it would be a first. You can imagine how brightly the building would have shone! The article stated that the quality of the stone was much better than that of the Cheops pyramid, till now considered the best. If that proved to be true, it would bear out the idea that this pyramid was truly majestic, and doubtless the first on the whole plateau. The vast site with its surrounding hills must have been very important, even long before the days of Djedefre, as just 1.5km to the northeast are some necropolises dating from the First Dynasty and the Pharaohs Ah and Den on one side, and on the other some tombs from the Fourth Dynasty that the IFAO have recently re-investigated. Just opposite the pyramid complex is the site of Heliopolis, the home city of sun worship par excellence. It cannot be just coincidence that this pyramid with its coating of gleaming gold alloy is sited on a high point overlooking the entrance to the delta and directly opposite the city of the sun; especially since Djedefre was the first pharaoh to formalise his connection with the sun god Ra by adding ‘Son of Re’ to his royal titles. It would be interesting to understand why some people think that the site overall was dedicated to Horus Khenty Khem (‘the first of Khem’), the patron of the blind, as in the nearby city of Letopolis, originally Khem. When Horus had both his eyes (the sun and the moon) he was called Hor-Khenty-Irty and when he was blind he was called Hor-Khenty-en-Irty. 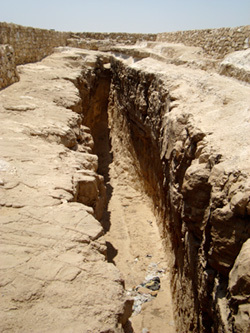 According to some experts the word khem refers to the fertility of the land after the Nile flood and therefore to the god Min. They consider that ‘Khem’ and ‘Min’ became ‘Khnum’, the name of the prime creator. Others point out that originally Min with his erect phallus was another representation of Orion. The town of Khem is known from the texts of the Old Kingdom and the Horus of Khem is mentioned in a panel of a tomb south of Saqqara. There are plenty of other puzzles to be solved on this vast site, in fact a whole list of anomalies. For one thing the sacred way leading to the pyramid is unusual, being 1700m long, which is much longer than other sacred ways that we know and underlines the importance of the site. What’s more, it leads in a northerly direction and is in fact oriented northeast rather than the usual east-west. As for the remains of the little brick-built temple at the foot of the eastern façade, one would expect it to have been a mortuary temple but it was not so, at least not in the beginning. 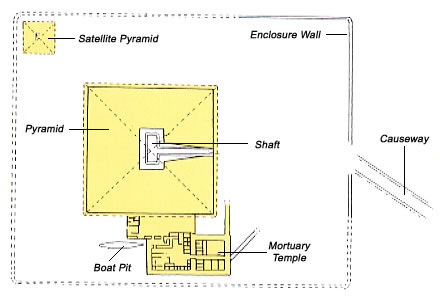 It was built in a very different style and, unique in the architecture of pyramid complexes, it was not aligned with the very long sacred way. There are other queries about the two small satellite pyramids. One has been known for a long time, since the work of Perring and Lepsius. Sited at the southwest corner of the main pyramid, one might think it was a pyramid used for the mortuary cult but there was no sign of any funerary objects within it. The other one, discovered in 2002 by the Franco-Swiss team to the southeast of the main pyramid, included a small underground structure with three chambers although above ground it was only 2m50 high with sides 10m long at the base. Apparently on the walls of the chambers were some splendid blue faience tiles like those in the pyramid of Djoser at Saqqara and in the south tomb of the same site. Also found was an alabaster vase 35cm high, fragments of a large alabaster platter and a measuring implement in basalt. Suddenly you see in the distance some steps going down When you get closer there’s a real surprise, you see an immense stairway plunging down a narrow trench. Since I speak Egyptian fluently I got on well with the guide who had been sent by the directorate of the site and he suggested going to look at something he called a Roman well. I must admit that I wasn’t particularly thrilled at the idea as I’d already seen many wells of the kind and was much more interested in the earlier periods of Egyptian history. The jeep made its way down the slope from the plateau and we began to wind our way along the bumpy tracks in clouds of white dust. The driver warned me that we were going into a very narrow one and sure enough we turned into a track that ran between two concrete walls topped with barbed wire and watchtowers, which continued a good kilometre on the west side of the plateau. We climbed a slight rise and stopped in the middle of nowhere. The sun was beating down, and though I could see in front of us the back side of the plateau where the Djedefre pyramid was, there was nothing else around us but a desolation of crumbling grey rocks and sand. Broken stones were scattered everywhere, and in the distance I could see the typical entrances of excavated tombs. Right away my eye was drawn to some steps in the distance. As I got closer I saw first of all a square shaft that was nothing out of the ordinary. 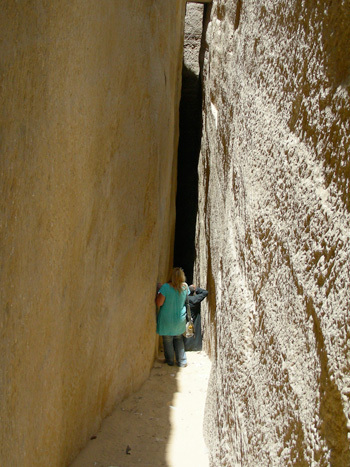 Then I realised that the steps continued quite a way to make a narrow passage going much deeper into the ground … I was stunned, never had I seen anything like it! I’d been down many entrances to underground structures in my wanderings but never into anything like this. The guide suggested we go down. The slope was a bit more than 15° at first then became steeper, continuing for about 80m. It was almost unnerving. The steps were short and very slippery with sand blown in from the desert but it was pleasantly cool and there was a strong smell of dampness. The walls were smooth to the touch and seemed to have been worked. Right at the bottom, certainly about 15m down, there was a pool of dark muddy water with some ragged shrubs growing. It looked as if the water table had risen. Looking up I noticed a huge block placed across the top of the trench and my guide told me that the whole thing was once covered with these blocks to make a roof for the stairway. The place had nothing at all in common with the Roman wells I’d seen in Italy, Spain and even in Egypt. I imagine that in the Roman period it had been used for keeping amphorae cool, but this monumental work seemed to me rather to be an entrance built by the ancient Egyptians to access an underground network, an idea confirmed when I saw two typical vertical shafts further on. But why had so much work been devoted to excavating the rock and building this monumental stairway? It occurred to me that it might be the entry to a ‘new’ Serapeum. If you continue a straight line going in the same direction as the stairway you come to the sacred city of Saïs then the Mediterranean. I left this extraordinary place with real regret, and with even more questions buzzing round my head. If no other article yet mentions this new discovery, I promise to investigate and tell you more about it in the future. Text published in the magazine: “L’Egypte” n°15, France 2008. Translation to English: Helen Caradon 2010. E. Chassinat, « Notes sur les fouilles d’Abou Roasch (1900-1901) », Compte rendus de l’Académie des Inscriptions et Belles Lettres 1901. « Le complexe funéraire de Redjedef à Abou Rawash » : état des travaux après 10 campagnes (1995-2004), Bulletin de la Société française d’égyptologie. 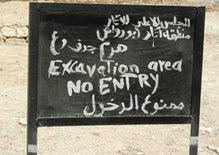 Z. Hawass, “Archaic Graves recently Found at North Abu Roash”, MDAIK 36, 1980.